New York Campus Compact is excited to lead the Campus Election Engagement Project effort in New York State. Campus Election Engagement Project (CEEP) is a non-partisan project that helps America's colleges and universities get as many of their 20 million students as possible to register, volunteer in campaigns, educate themselves, and turn out at the polls. Focusing on administrators, faculty, and staff, and ways they can help engage their students, we worked with 500 schools in 2008 and hope to work with even more this round. Now that the debates are over, use these non-partisan, unbiased issue guides to sort out the pros and cons of 6 of the nation's most talked about topics including: immigration, the federal budget, energy, health care, education and the economy. Developed by Public Agenda, these guides can be used by decided and undecided voters to think through the difficult issues in alternative ways. Thanks! And remember to vote! Happy Election Eve, everyone! Here are some great ideas and resources for the next 48 hours and beyond. 1-866-OUR-VOTE: Make sure students, staff and faculty know they can call this number to verify their registration status, locate their polling place, learn what ID they may need at the polls, and get answers to other election-related questions. The toll-free line is open today from 8:30 a.m. to 8:30 p.m. Eastern time and 6 a.m. until the polls close nationwide on Election Day. You can also email info@866ourvote.org for more information. On Election Day, if you encounter long lines, or your right to vote is questioned, or you see other voters having difficulty, please call 1-866-OUR-VOTE immediately: The hotline will have people standing by to help. Election Protection Smartphone app: This is a great way for students glued to their mobile devices to get all the information they need, including registration verification, looking up their polling place, reviewing key voting rules and regulations for their state, and contacting Election Protection via phone or email to report a problem or get answers to their questions. You can download it right here; you can also text OURVOTE to 90975 to download the app. Finding your precinct: Students and others who aren't sure where they're supposed to vote can text "where" to 877877; they'll receive a response asking for the address on their registration, and then they will immediately receive the location of their polling place. Make sure students in your state and on your campuses know about this handy tool. Hurricane Sandy changes: Election Protection has also put together a helpful breakdown of changes to state voting procedures in the region devastated by the recent hurricane. Make sure you know what the new rules are and inform others. 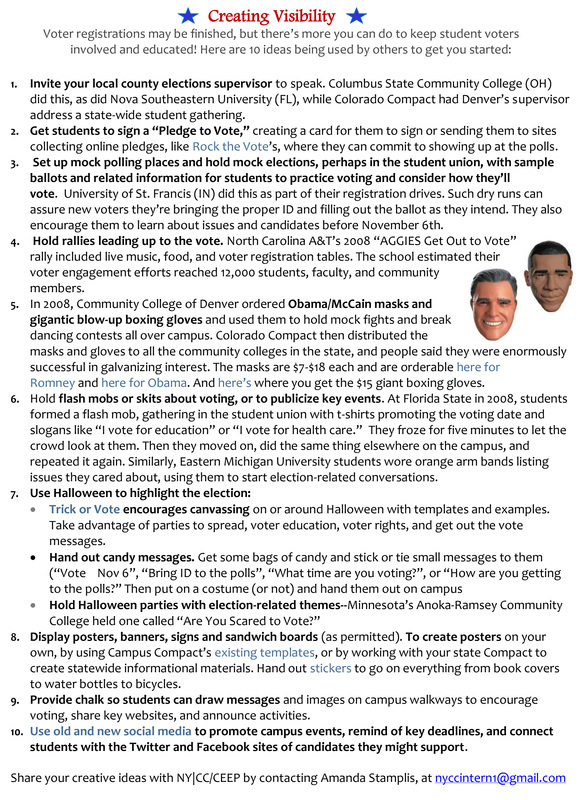 More Things You Can Still Do: CEEP's 33 Things You Can Still Do to Engage Students in the Election is relevant to your state and campus even now! Nearly half of those 33 Things cover Get Out the Vote efforts such as campus parades to the polls, Election Protection measures such as distributing the 1-866-OUR-VOTE number, and Post-Election Engagement ideas such as forums for students to discuss the meaning of the election and their role in it.